On 30 August Exxon announced the ninth discovery offshore Guyana at the Hammerhead-1 well, adding to the resource base of 4 billion bbls of oil equivalent found since the Liza discovery in 2015. Liza is expected to be onstream in 2020 and there was already the potential for Guyana to reach 750 000 bpd by 2025. The significance of Hammerhead is that it opens a new play in sandstone reservoirs of Tertiary age, younger and distinct from the previously successful Cretaceous aged reservoirs in the Liza sandstone play and Ranger carbonate plays. The new Tertiary play opens the pathway for the emergence of a possible 10 billion bbl plus province, second only in its scale as a new emerging province this century to the Pre-Salt of Brazil. What is also remarkable is that Guyana has a population of only 800 000 people. This scale of resource could support a plateau production level of over a million barrels a day for a decade or more. 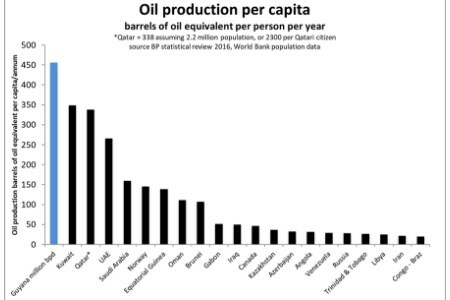 One million bpd of production would equate to 456 bbls per citizen per year, which would make Guyana the world’s biggest per capita oil producer. At US$70/bbl this level of production would generate US$32 000 per capita of gross annual oil revenue, before costs and oil company profits. With a current GDP per capita of US$4750, Guyana faces an extreme transformation in its fortunes.